Unfortunately I never officially ‘learned how’ to prune a rose bush. I did, however, watch my mother prune her weeping rose bushes (about 50 of them) faithfully every spring. My small rose garden is fairly young, about 3 years old, and only has a small handful of bushes but I have been very impressed with how well they have grown and how beautifully they produce. Roses are a relatively low maintenance plant; with a bit of spring time pruning the payoff is incredible! Question # 1 – When is best to begin pruning? 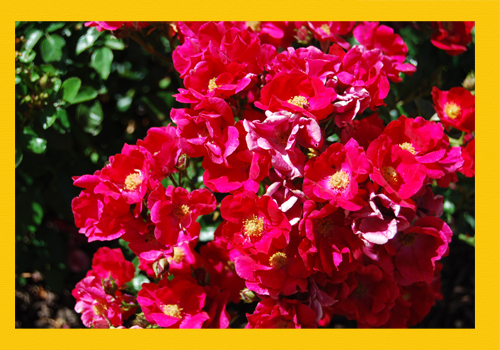 Rose bush pruning is typically done in the early spring when the leaf buds begin to swell and the bumps on the canes get larger and turn a deep red color. Now that you understand WHY and WHEN to prune you are ready to get out your shears and get to work. Pruning takes time and practice but luckily roses are rarely killed by a bad pruner. Keep in mind the four reasons (listed above) ‘why’ you are doing this task and you will succeed. To begin, identify the parts of the plant that are dead, broken or dying. These parts will look shriveled, dry and lifeless. Starting close to the base of the plant will save time by eliminating larger branches first (usually the same ones the smaller ones are attached to). Cut branches that are sprouting up from the roots (suckers) as they will not bloom. You also want to pay attention to the base of the bush first so you can open up the center to let the light in. Always make your cuts at a 45° angle and be sure the cut is clean, not jagged (using sharp tools will ensure a clean cut). The inside of the cut cane should be white, if it is brown and dead you should cut down further. Removing thin and spiny branches will improve the overall health of the rose by allowing the nutrients to be used up by big healthy branches, the ones that produce the big beautiful roses. 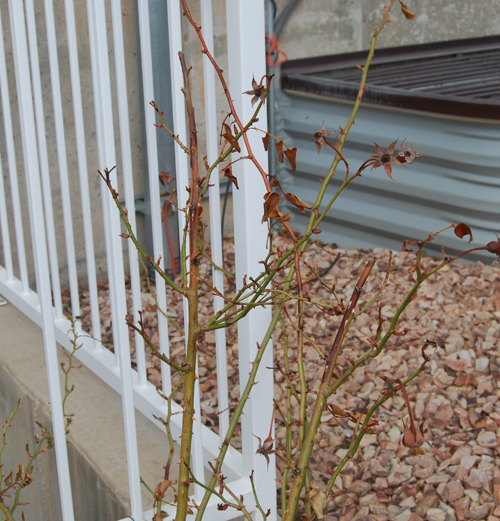 Here is what one of my roses looked like before it was pruned. Notice all of the spent blossoms, the dead cane tips, and the small spindly branches. 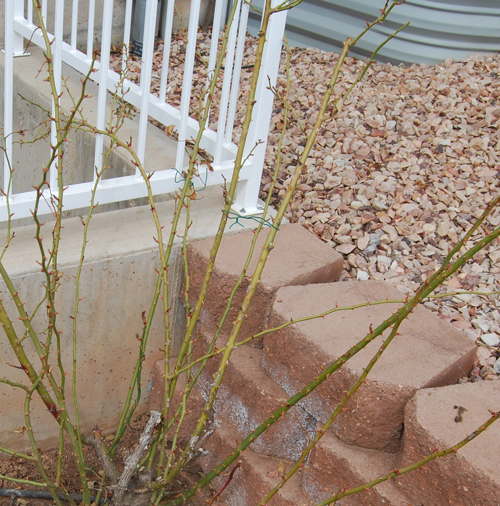 Here is the same rose bush after pruning. All of the blossoms have been removed, the dead canes are gone, and only the strong sturdy canes remain. (Looking back at the pictures I realize I could have cut a few more small branches and I should have done the pruning earlier in the season before the leaves had sprouted so much. But remember, pruning is an art that must be learned over time. I’m still working on it!) This particular plant is a climbing rose so I am working to train it towards the fence. Stay in touch to see the progress of this particular 3 year old climbing rose bush! This entry was posted in In the Dirt and tagged Flowers.